Dr. Wu is a Comprehensive and Esthetic Dentist highly skilled in cosmetic and surgical procedures including Crown and Bridges, Implants, Invisalign, Wisdom teeth extractions. 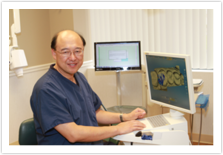 Dr. Wu is a graduate of the Tufts University Dental School and holds Master degree of Oral surgery from China Medical University Dental School. He takes pride in thoroughly educating patients about their oral condition and the gentle, conservative treatment of dental pathology. He strives to create the perfect smile that functions in precise harmony with biological function. Dr. Wu is a member of the American Dental Association, Connecticut State Dental Association and the Middlesex County Dental Society.